UCMS Group Russia provides highest quality, innovative business administration services to support its customers. 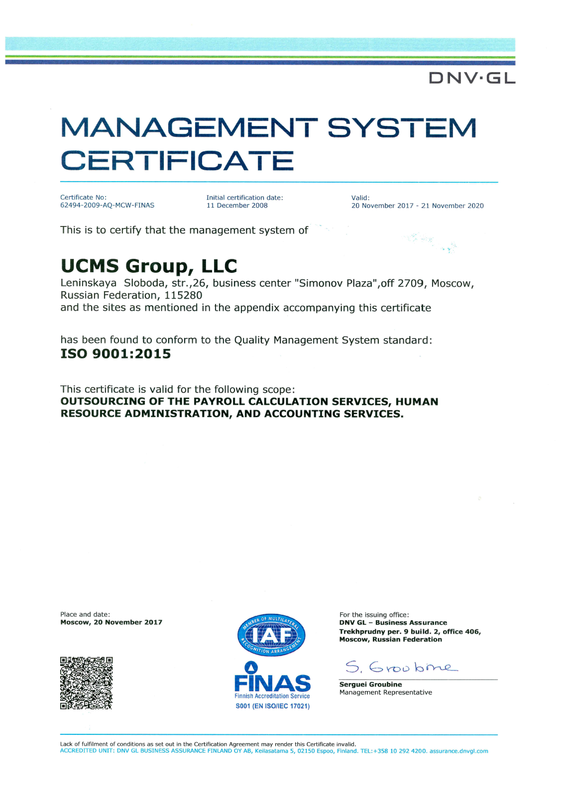 UCMS Group has implemented ISO 9001:2015 standard. We aspire to be the leading provider of Payroll, HR Administration and Accounting Outsourcing Services in Russia. We are all committed to comply with the requirements of ISO 9001:2015 standards and continuously improve our quality management system. Seeking to meet global and Russian standards of responsible business, UCMS Group assumes commitments in the field of corporate social responsibility and strives to bring these commitments to all our employees, partners and suppliers. We are committed to comply to requirements of ISO 27001:2013 standards, making them an integral part of our business culture. We aim to increase trust of our customers, improve our Company’s attraction as a Partner who takes information security seriously.